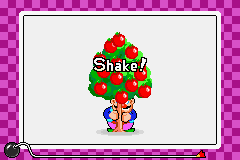 High Treeson is a microgame in WarioWare, Inc.: Mega Microgame$! in the Anything Goes folder and returns as one of Wario's Twist League microgames in WarioWare Gold. Its name is a pun on "high treason". 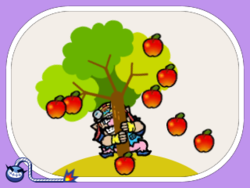 The objective of the game is help Wario shake the goodies off of the tree and collect them all. 1st level difficulty: The tree is full of apples; the player must press the D-Pad 8 times or do 4 full twists to shake them off. 2nd level difficulty: The tree is full of cherries; the player must press the D-Pad 11 times or do 5 full twists to shake them off. 3rd level difficulty: The tree is full of Christmas decorations; the player must press the D-Pad 15 times or do 6 full twists to shake them off. This page was last edited on September 18, 2018, at 14:45.